There are many reasons to undertake home renovations. Some people do them to improve the resale value of their house while others need to expand their home for their growing family. Regardless of why you’re renovating your home, you always need to consider how you’re going to finance your project. Whether you’re doing it yourself or hiring a contractor, home renovations are a significant financial investment and it’s important that you plan accordingly. Click here to see more testimonials or check out our Google+ page! We currently live in a society that both encourages and strives for instant gratification. Sometimes it’s better to go against the grain and take the time to save up enough money to complete a home renovation without the help of a financial institution. This tactic is usually the best for smaller renovation projects that are more realistic to save for (e.g. a bedroom renovation vs. a full-fledged kitchen renovation). If you have a credit card with a limit that matches your renovation price, then you can consider using it to front the money you don’t have on hand. This is a simple way of financing your renovation, however, credit cards typically have very high interest rates so this option is better suited for less expensive projects that you can pay off quickly. 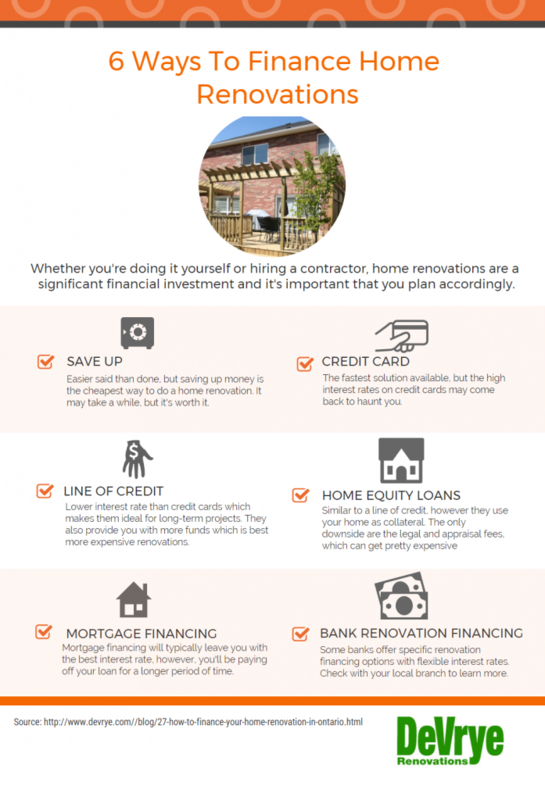 This kind of financing is best for long-term and/or ongoing renovations because it lets you access your funds at any point in time with a monthly report that helps you keep track of all of your renovation expenses. Lines of credit also have lower interest rates than credit cards, which is why they are ideal for long-term, more expensive renovations that you won’t be able to pay off as fast. Another benefit is that once you pay off your line of credit you can continue to access any remaining funds (up to the original limit) without having to reapply. These types of loans are very similar to a line of credit but they use your home as collateral. They usually offer the best interest rates and allow you to use up to 80% of your home’s value. This means that you can have a higher limit, which is better for extreme renovations. The main downside to this type of financing is that setting up a home equity loan requires legal and appraisal fees that can get pretty expensive. There are a couple of ways that you can use a mortgage to finance your home renovation. If you’re buying a new home and are planning to renovate it, add the estimated renovation costs to your mortgage. Mortgages typically have the best interest rates, much better than lines of credit and home equity loans. You can also do this if your current home already has a mortgage, by refinancing your major renovation budget into your mortgage. This allows you to spread repayment over a long period of time. Using a mortgage to finance your renovation usually has the lowest interest rates but it also means that you are going to be paying off your renovation for a long time. At DeVrye Renovations, we work with TD Canada Trust to provide our customers with Home Improvement Loans. This kind of financing is ideal for home improvements because it’s specially designed for these kinds of projects. To learn more about how it works, click here. Overall, There are several ways that you can finance your home renovation, each with its own advantages and disadvantages. Creating a responsible financing plan that is catered to your unique renovation is essential to having a successful home renovation. Be sure to do your research, get multiple estimates, and explore your options. Good luck!